Along with dentistry, a love of biology was also passed on through the generations; Stavros remembers growing up with family members who were constantly perusing and discussing biology texts. So it was with a sense of searching for his roots that he decided to take up molecular biology instead of dentistry during his undergraduate studies at the University of Crete. 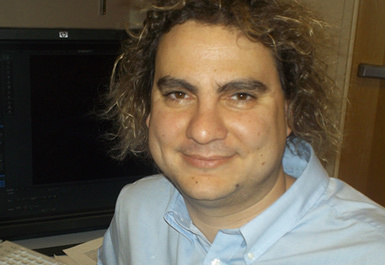 Today, Stavros is an associate professor in the Anatomy Department of the University of California, San Francisco School of Medicine, where his research focuses on the expression of olfactory receptor genes in mammals. These genes guide the synthesis of proteins that constitute the olfactory receptors, which help us make sense of the millions of odorants in our environment. Although sense of smell in humans is now used for purposes that are not essential for survival, it remains a vital function for most mammals, and is crucial for finding food, selecting mates, and avoiding predators. 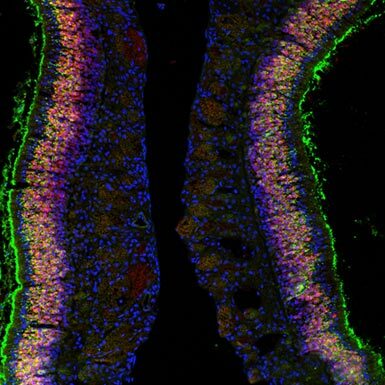 Accordingly, this gene set is the largest to be described, and one of the most complex: 5% of mammalian genes, or about 1,000 different genes, are dedicated to sensing odors, and each gene corresponds to exactly one type of neuron. The Lomvardas lab aims to uncover the mechanisms by which these genes are transcribed. “It’s hard to imagine the mechanics that allow a neuron to select one of these 1,000 genes, express only this gene, and have all the other genes completely silent,” Stavros explains. 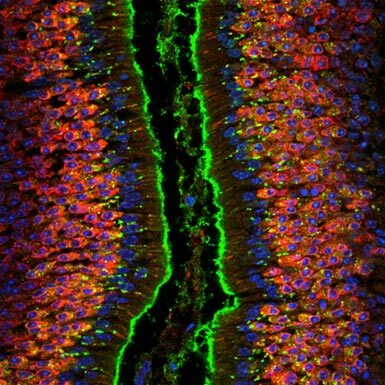 Thus far, his lab has made tremendous progress toward determining how olfactory neurons silence the expression of other genes once a particular gene has been selected. “There’s a very interesting signaling pathway that tells the transcription machine to stop searching for an olfactory receptor,” Stavros says. The next piece of the puzzle is determining how that gene is chosen in the first place; he likens it to trying to understand the roll of a 1,000-faced die. Insight into this process could advance our understanding of other gene families that are expressed in a similar stochastic and mutually exclusive fashion. For now, Stavros and his research are both thriving in California, which, he says, “is a lot like Greece,” weather-wise. However, this summer, Stavros will be moving back to New York, where he will be joining the faculty of Columbia University, the institution where much of his scientific career started. And while New York may not have a temperate climate like the Mediterranean, it is much closer to Greece; so close that Stavros’ family traveled to New York last month to see him accept his honor at the annual Vilcek Foundation Prizes gala — even if it wasn’t for dentistry.